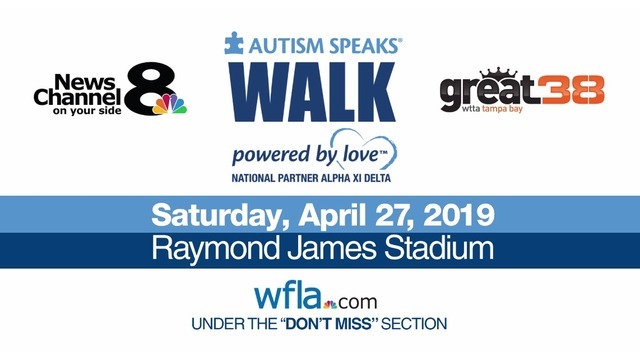 TAMPA, Fla. (WFLA) - WFLA News Channel 8 and WTTA Great 38 are proud to partner with the Tampa Bay Autism Speaks organization to help spread awareness and acceptance of those with autism and their loved ones. On walk day, WFLA News Channel 8 and WTTA Great 38 reporter Lila Gross will serve as the official emcee and is thrilled to be involved. And you can be a part of it too! WFLA Lila Gross and her brother Josh at the 2018 Autism Speaks Walk at Raymond James Stadium. The Autism Speaks Walk is the world's largest fundraising event powered by the love of parents, grandparents, children, siblings, friends, relatives and support providers for the special people in their lives living with autism. Thank you in advance for your support! We look forward to seeing you at Raymond James Stadium (North Parking Lots) for the Tampa Bay Autism Speaks Walk Day on April 27th. CLICK HERE to join the WFLA News Channel 8 Autism Speaks Walk team. We hope to see you there!